Food envy is a real problem that has not received enough coverage. How often have you finally taken a punt on the lamb dish only to watch the waiter waltz past with beefy nirvana destined for some smug diner on another table? When your own dish arrives it will inevitably be seasoned with regret and sadness – the piquant sauce of what might have been. All is not lost though, as the cunning Spaniards have hit on an excellent solution – order a load of individual small plates as and when you fancy them and if something delicious walks past, order some of that too. Tapas is genius. Sadly, because of its popularity and ubiquity good tapas is very hard to find. In Barcelona you can stumble into any old dive – Tapas24 for instance – and have a phenomenal meal. In London it’s a little harder – there are big chains which do a reasonable job and independent tourist traps with laminated menus that commit horrendous crimes against food. There are a few gems – Brindisa do wonderful work and I have an unhealthy obsession with Little Taperia in Tooting (though please don’t go, it’s busy enough as it is You won’t like it. Honest.) A few months ago the ever reliable Jason Atherton (him of Pollen Street Social, Little Social, Social Eating House, lots of Socials…) opened a new joint behind Selfridges – Social Wine and Tapas. The premise is simple – a short, focussed menu of tapa, blending traditional ingredients with modern interpretations. 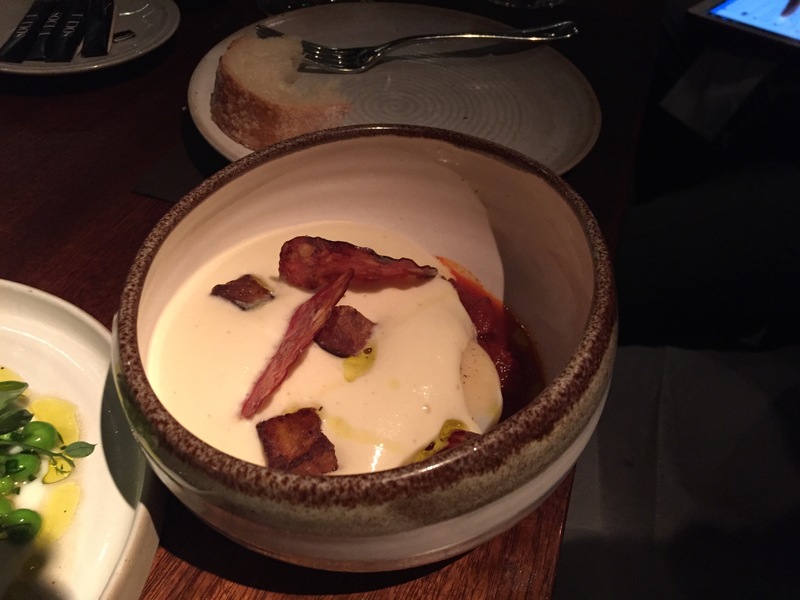 Patatas Bravas is served with a potato foam, sardines come with a citrus yoghurt. We adored the suckling pig – crisp crackling and achingly tender flesh with a wonderful charred pineapple chunk. It’s smart, fresh and executed with precision. The raw ingredients are superb – the jamon selection includes Iberico ham of such porky intensity that you can practically taste the happy grunts of the pig as it gorged on acorns. 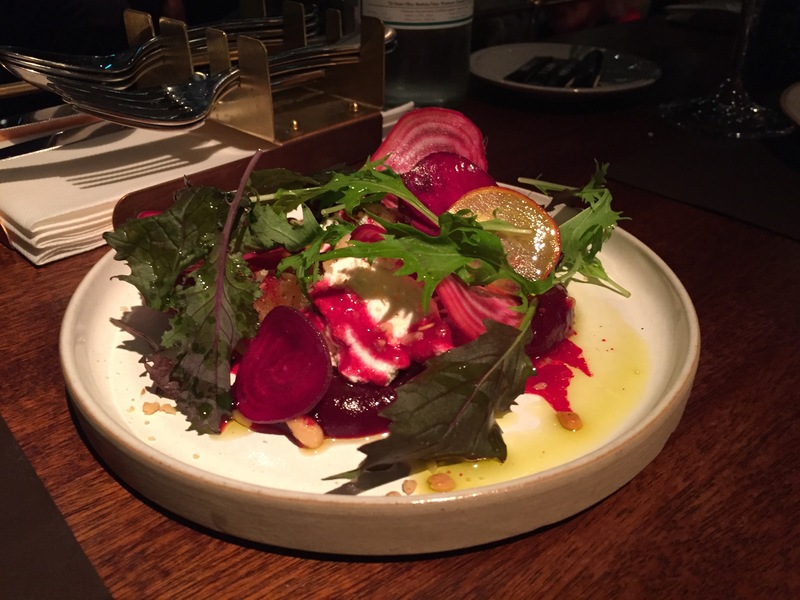 Even the vegetable dishes are a delight – beetroot nestling happily next to lactic cheese and a gorgeous red wine jelly, charred carrots with a smokey aubergine puree – we didn’t find a bad dish. The desserts are equally good – a rich chocolate tart and a clever, moussey crème catalena. The wine list is very extensive, covering all the major wine regions of the world. Importantly, there’s also around forty wines available by the glass, starting from just £4. They mix old favourites with newer discoveries – the txakoli is wonderful with fish. My pick though, is the house red from Pollen Street Social. I’ve had it before at Little Social and it’s still marvellous. A cabernet franc from Anjou in north-west France, it’s full of black bramble fruit and silky smooth tannins. A glass of that and the frankly tremendous suckling pig is a near perfect evening in itself. One of my favourite features is the ability to take a bottle home afterwards at retail (rather than restaurant) prices. I may have bought a magnum. The décor is dark and sophisticated – with interesting bottles scattered around the walls. The staff are wonderfully polite and happy to describe the wines and offer tastes if you’re unsure. Being able to order as you fancy and pick reasonably priced wines to match is a great way to spend an evening. I’ll definitely be back, but in the mean time I have an enormous bottle of wine which needs enjoying. Blame a recent trip to Dubai (of which more soon) but I’m rather hooked on the idea of a long, boozy brunch. Keen to explore what London has to offer in this category I booked myself in to Flesh and Buns, cleared my afternoon and prepared to enter a food coma. Flesh and Buns is part of the Bonedaddies family – located in a trendy basement in Seven Dials the decor is like a slightly younger Hawksmoor – exposed brick, leather chairs and muted lighting (every blogger’s worst photographic nightmare…) The premise is simple, there is a basic menu for £39 which gets you a cocktail on arrival, unlimited red/white/prosecco with your brunch, unlimited small dishes, a ‘signature’ flesh and buns, and a dessert to share. An extra £7 gets you access to pricier small dishes and flesh, while another £10 gets you unlimited champagne. There’s a two hour limit on the table to stop things getting out of hand, trust me when I say that’s plenty of time. While it might seem pricey – when you compare it to the cost of dinner here, it’s a steal. To start we had a kimchi bloody mary – the tangy, fremented Korean cabbage adding a really nice kick to the brunch staple. The prosecco we then switched too is surprisingly good – light and not too dry. Opting to upgrade to the full menu we tried most of the small dishes. Korean fried wings were sticky, sharp and wonderfully crisp. Chicken yakitori was succulent and sweet. The fried squid came in popcorn sized bites and had a lovely crust. The real star was the softshell crab – the jalapeno mayo was just potent enough to match the crunchy crustacean and was promptly used for coating everything else on the table. The sushi is excellent quality for an ‘all you can eat’ option – the tuna being especially good. For the ‘flesh’ course we tried the piglet belly and flat iron steak. The pork was a real masterpiece – crispy skin, fondant-soft meat and wonderfully seasoned. The big pillowy buns reminded me of Momofuku and were almost as good. The steak was nicely medium-rare and had a great barbecue sauce. At this point – barely able to move and feeling the effects of around a bottle of prosecco each we tackled the dessert. “S’mores and chocolate fondant” may not sound much, but when the flaming charcoal brazier arrives at the table so you can toast your own marshmallows – it’s pretty special. Gooey, hot marshmallow, crunchy biscuits and sharp black chocolate is always going to be a winner. The fondant was beautifully made and came with a lovely ice cream – much needed after the lava-hot marshmallow. Flesh and buns is by no means authentic – it’s London at it’s best: multi-cultural, cosmopolitan, brash, loud and a little bit decadent. If you’ve got a better way of spending a Sunday afternoon, I’d like to hear it! While British cuisine may have its fair share of shameful chapters we can always be proud of our approach to breakfast. 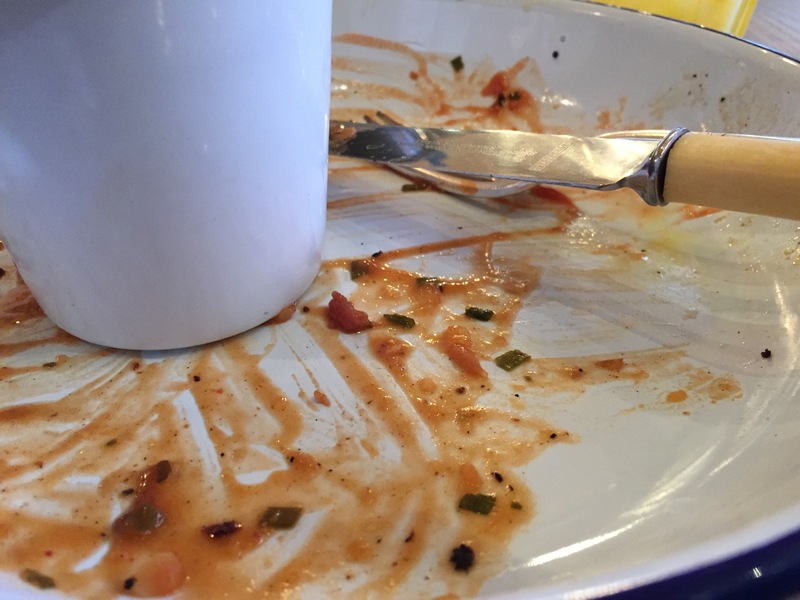 While the French may have great pastries and the Americans essentially invented the modern brunch there are times when only a Full English will do. The Empire was built not on tea or roast dinners, but a heaving plate of fried pig. Honest Burgers have been waving the flag for quality British burgers for a couple of years and have recently added several new outlets in London. Part of this expansion is the offering of a proper breakfast menu in select locations – starting with Clapham. 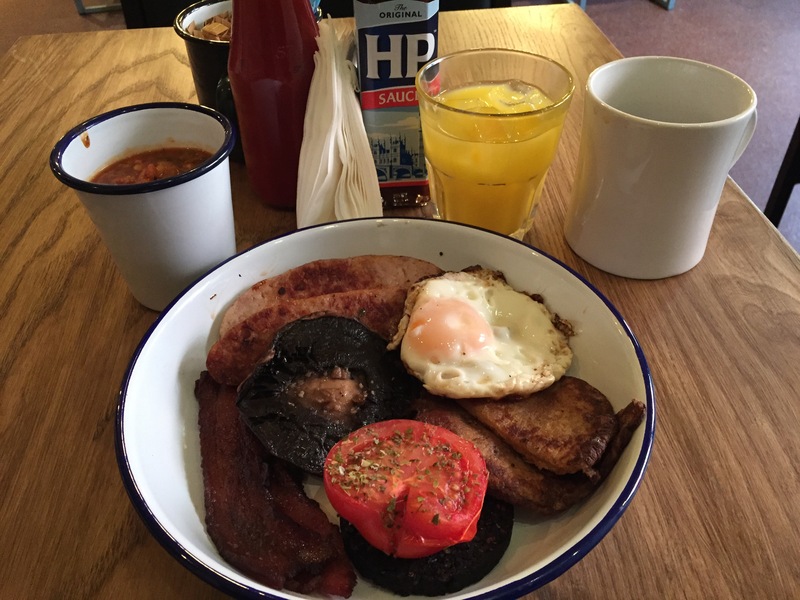 It’s not complicated – take great quality ingredients from the heroes at The Ginger Pig and cook them well, serve with fresh orange juice, bottomless coffee and a smile. The sausage is great, the bacon thick and the black pudding a league above your average greasy spoon. Their house baked beans – doctored with Chipotle, cola and bacon are an “optional extra” but they’re absolutely not optional. Thick, savoury and utterly wonderful with just enough spice for the morning. The staff are bright and cheery, the atmosphere is chilled and the coffee is great. If there’s a better reason to get out of bed on a cold wintery morning – I’ve not found it. London is a gastronomical destination – it boasts some of the best restaurants in the world and every cuisine is catered for. Despite this unarguable wealth, there are a surprising number of ‘dead spots’ – foodie wastelands populated only by kebab shops, pret-a-manger and dodgy pubs. Victoria is one of these places – a transport hub used by millions, but if you asked me to name one restaurant there that excites me, I’d struggle. Enter Kouzu. Opposite the Goring Hotel and within spitting distance of the station itself, the newly opened restaurant is dressed as sharp as the sushi knives wielded within. At ground level there are large airey windows, muted colours and sophisticated decor, on the mezzanine upstairs there’s a more relaxed feel with an open sushi counter and a livelier atmosphere. The food is modern Japanese, in the very best sense of the phrase. A commendable respect for ingredients (and they really are wonderful) but presented with a sense of style and an appreciation of Western palates. It’s a winning combo. The staff are efficient, friendly and most importantly – knowledgeable. I asked for a cocktail with whisky and citrus and was presented with a smokey sour that’s so good it’s worth a visit in it’s own right. They also know their fish – I’m certainly no expert on the underbelly of tuna but they’re more than happy to guide you. We started with yellowtail sashimi in a white truffle dressing – generous slices of smooth, buttery fish under a brilliantly refreshing salad. Truffle can be overpowering but here it was just a subtle hint – they matched it to the delicate fish perfectly. Foie gras with teriyaki wasabi is rich and decadent – carefully cooked it’s a great example of how fusion cuisine really can work. The wasabi is the real deal, freshly grated and with a creamy, restrained kick that’s a million miles from the packaged versions. A spicy california roll was head and shoulders above the usual high street offerings, but the real stars were the ‘aburi nigiri’. Seasoned by the chef and brushed with a blowtorch – it’s the perfect mouthful. Rich, flavoursome, light and with clever little sparks of chilli or truffle. Both toro and yellowtail were superb. It’s easily the best sushi I’ve eaten in London. There’s a good range of mains – we opted for two specials, their miso black cod and duck breast with sansho. The cod was a generous steak, marinaded for three days and cooked beautifully. It was creamy, flaky and nestled atop a fantastic orange sauce. It’s not an obvious pairing, but it really helps bring out the richness of the fish. The duck breast was equally good, all moist meat and sticky glaze. Asian cuisine has never been strong on desserts and in most restaurants they’re an after thought. Wisely they’ve chosen to re-interpret French classics with some cunning oriental twists. A textbook dacquoise comes garnished with bananas and a coconut ice-cream, yuzu sorbet nestles next to a towering Mont Blanc. In line with the rest of the menu they were clever, light and balanced. Like great Japanese food, Kouzu is harmonious: upmarket without being eye wateringly expensive, traditional without being stale and modern without being crass. There are some dazzlingly clever culinary ideas on display here and they really do work. It’s some of the best Sushi I’ve ever eaten and easily the best place to eat in Victoria. Go now. Occasionally you have a meal that restores your faith in humanity. That for all the UKIP by-elections and depressing global statistics gives you that warm fuzzing feeling inside. Someone who loves what they do has really thought about this, carefully prepared it, and presented it for my enjoyment. It’s the best kind of comfort food and it’s available at Bell’s Diner. In the back streets of Bristol it’s an utter gem: a rambling assortment of quirky rooms and mismatched furniture. There’s a real charm which extends to the menu tucked inside an LP cover. The menu is as eclectic as the decor – british, european, mediterranean and thoroughly modern. Most are small plates, but a few come in larger sizes. The wine list is the same – quirky and dangerously tempting. On prior advice we order the Jamon Butter and Salt Cod Croquettes while we salivate furiously over the menu. The butter is rich and porky, served with some lovely bread while the croquettes are the ultimate beer food – fried, fiercely salty and strangely addictive. In a complete failing of self-restraint we order half the menu and a little parade of dishes start spinning out of the lovely open kitchen towards our table. Babaganoush is rich and smokey, falafel are pert and crunchy and the simple chorizo/morcilla stacks are gorgeously oily. Spiced lentils with yoghurt are the perfect antidote to a freezing November evening and the perfectly seared scallops bring a little waft of sophistication. The main events are a stunning little quail, blushing pink on a heavenly autumnal salad followed by a barely cooked onglet – it’s rich minerality bursting through a deep, smokey char. There’s a Big Green Egg in the kitchen – the professional barbecue beloved of Great British Menu and Neil Rankin. Like the similar Josper grill, in the right hands it does wonderful things to meat. The dessert menu is short but very comforting – a treacle tart is just as it should be while the chocolate torte comes laden with figs and a boozey marsala hit. Some dangrously rich salted caramel truffles keep us company while we wait for the bill and resist the urge to do it all again. It’s gorgeous food – wide-ranging, comforting and confidently cooked. They don’t limit themselves to one cuisine, but manage to create a menu that doesn’t feel disjointed or scatter-gun. It’s exactly what I want on a cold, dark evening and it’s exactly what a local restaurant should be. I’m a little sad I live so far away from it.